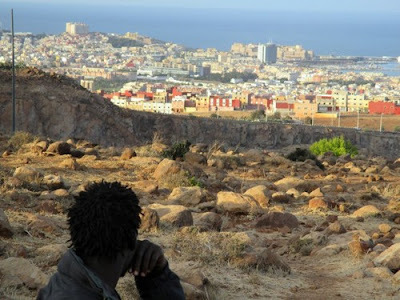 After several months of trying to cross the border between Morocco and Spanish controled enclave of Melilla Abou Bakar Sidibé is given a camera by Moritz Siebert and Estephan Wagner and asked to film his daily life and attempts to get over the border and effectively into to Europe. Slice of life documentary about the refugee life is a some what interesting look at the day to day existence of those trying to find a better life for themselves. Some people are going to be bothered by the pacing (it has slow bits) and the uneven camera work (it was shot by an amateur). I am up and down about the film, I like what it documents but I never was engaged enough to truly give myself over to it. In fairness my problem is that while watching the film I couldn't shake either the refugee sections of FIRE AT SEA or the similar themed REDEMPTION SONG which played at the Harlem Film Festival, and which has haunted me ever since. While I know one must take each film on it's own terms some times that isn't possible and for me here, it wasn't possible. Recommended for those with an interest in the subject. The film plays today at noon at DOC NYC. For tickets and more information go here.